As the winter photo season approaches this year and as I start feeling better from post back surgery, I've been really wanting to get out and explore some of the the Bay Area and Northern California coastline I haven't seen in the past. 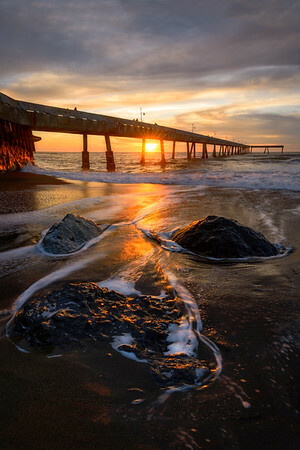 Pacifica Pier was one of those places, that has been on my radar for a while, but yet to visit. Location wise there are some really nice long sand beaches, and just to the edge of the pier is what I have decided to affectionately call the "triplets." A group of three rocks slightly buried in the sand, that create some great water lines as the tide pulls back.